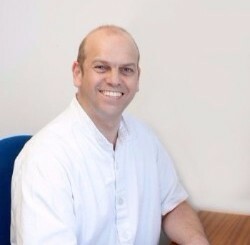 Taunton born Dan Sparks graduated from the Anglo-European College of Chiropractic in Bournemouth in 1993, in one of the first years that the chiropractic qualification was granted degree status. The following year, he was awarded his postgraduate diploma. He spent the next 8 years working in mid- & north Somerset, before taking a year out, to travel round the world. He has spent the past 9 years working in Sheffield, plus a year providing locum services for chiropractic clinics all over the country. Having recently returned from another stint of world travel, he has brought his family back to the West Country, to be closer to his roots on the Blackdown Hills. As a life long cricket fan, this will enable him to be able to take his two primary school aged children to watch Somerset at the County Ground! His other great love is music: writing, recording and playing guitar, as well as enjoying watching other artists performing. Since qualifying, Dan has undertaken extensive post graduate study, regularly attending educational courses to keep up to date with current research, treatment methods & best practice. As well as having been in practice for nearly 20 years, Dan has also taught at both undergraduate & postgraduate level, giving lectures on a variety of subjects, including biomechanics, patient examination techniques, & differential diagnosis. He has been a Member of the College of Chiropractors since its inception, and has also participated in a number of research projects whilst in clinical practice.